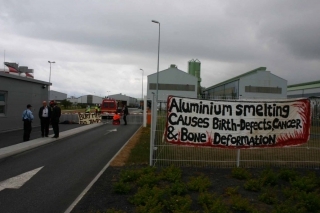 Sól í Straumi, an interest group in Hafnarfjörður opposing the plans to enlarge the Straumsvík aluminium plant, harshly criticize the organisation Hagur Hafnarfjarðar, a group of people and companies that have vested interests in the smelter, for being biased and using fear propaganda to influence the people of Hafnarfjörður to vote in favour of the enlargement. The smelter (it’s the one you pass when driving to or from the Keflavík Airport) is owned by the industrial giant Alcan Iceland Ltd., which is now planning to increase the smelter’s annual capacity from 170.000 tons to 460.000 tons. The inhabitants of Hafnarfjörður will get the chance to vote on the subject on March 31st. The newly established organisation Hagur Hafnarfjarðar has one main goal, to support a bigger smelter so as to maintain a flourishing economy in Hafnarfjörður, as they put it. 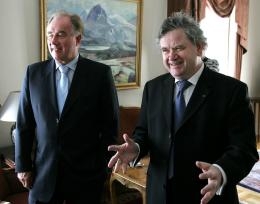 In reaching that goal, their spokesmen have been encouraging Hafnarfjörður inhabitants to vote in favour of the enlargement, arguing that if they reject these plans the smelter will close down in the near future. That will have dramatic affects on the smelter’s employees as well as all the companies doing business with Alcan, which are, according to Hagur Hafnarfjarðar, approximately 1.500 people and more than one hundred companies. Sól í Straumi, refuse these predictions altogether. In a statement issued yesterday they accuse Hagur Hafnarfjarðar of using misleading information and fear propaganda to influence the townspeople. According to the statement, Sól í Straumi challenge Hagur Hafnarfjarðar to be more responsible in the debate and stop trying to persuade Hafnarfjörður inhabitants by arguing that their jobs are in danger. They also reject the statement made by Hagur Hafnarfjarðar that 5-7% of the municipality’s income can be traced to the smelter. The number is closer to 1-2% of the town’s total income, they argue. According to a survey made by the newspaper Frettabladid over 63% of Icelanders are against the expansion of the ALCAN smelter in Hafnarfjördur. Under 36% support the expansion. The people of Hafnarfjördur will vote on the expansion in a referendum 31 March. ALCAN have gone into overdrive campaigning with threats, bribes and lies. The outcome may very well be indicative of how the nation will vote in the coming general election on 12 May. If the people of Hafnarfjördur vote against ALCAN it will likely be the first death blow to the heavy industry policy of the Icelandic power mafia. According to a new Gallup Capacent poll, conducted for the Iceland Nature Conservation Association (INCA), 72.8% of Icelanders believe that political parties should place more focus on environmental protection. When asked if political parties should give more attention to environmental protection, 37,2% answered that the parties should give a lot more attention to environmental protection, while 35,6% answered that the parties should give more attention to the topic. 22,6% Answered that they believed that environmental protection was receiving adequate attention, while 4,6% believed that environmental protection was receiving too much attention. There was a noticeable difference in opinion between the sexes, with around 78% of women in favour of more environmental protection, with 67% of men answering the same way. Of 1350 people polled, 800 answered. Saving Iceland has been alerted to a report broadcast today 21 February by RUV, the Icelandic National Broadcast Service. The report is about an act of sabotage in Hafnarfjordur claimed by the Earth Liberation Front. In the first week of the new year ELF (Earth Liberation Front) struck in Iceland for the first time. The target was the Alcan Aluminium smelter in Hafnarfjordur which is being expanded into pristine lavafields without local democratic consent which was promised in the town council elections. This factory is part of ongoing heavy industrialisation of the Icelandic wilderness powered by large dams and geothermal power stations all around the country. UPDATE 2007: Recently Alcan had to give up its participation in the bauxite mine because of protests against its human rights violations and environmental devastation. Alcan has been accused of cultural genocide in Kashipur because mining and dams have already displaced 150,000 mainly tribal people there. Canadian mining and aluminium giant Alcan (in Iceland Alcan Iceland Ltd. and ISAL) want to get their hands on one of the world’s richest deposits of bauxite – the raw material for aluminium – in the Kashipur region of India. The $1.4 billion monster strip-mine and refinery promises to displace up to 20,000 people, destroy their livelihoods and culture, contaminate food and water sources and obliterate their spiritual sites. The camp will start 6 July. The conference on the Global Consequences of Heavy Industry takes place at the camp 7-8 July. 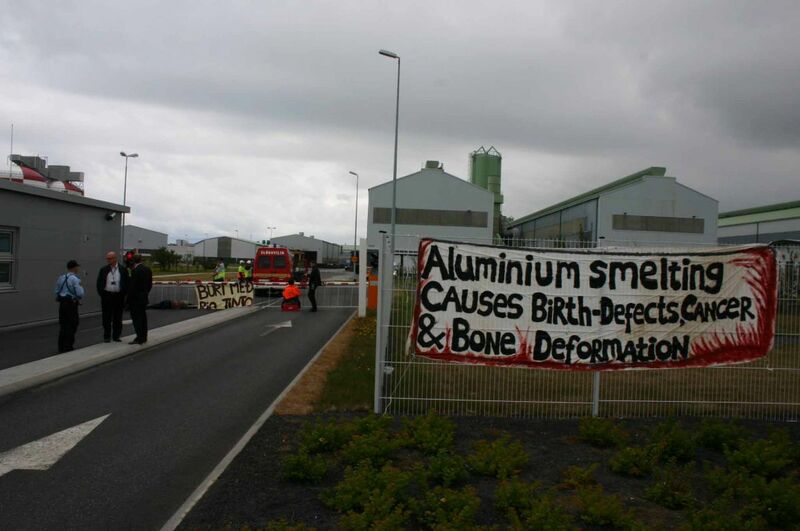 Academics, activists and other people affected by the aluminium industry, dams and environmental destruction will come together to discuss their experiences and think about how to build up stronger local and global resistance.